Classically-trained multi-instrumentalist, Gryffin, recently released the acoustic session video for his debut single, ‘Heading Home’ featuring Josef Salvat, via Darkroom/Interscope Records. Gryffin apparently has a reputation for focusing on musicality in all of his work, so this acoustic session is a natural next step for him to further showcase his instrumental skills. With 20 million+ streams online and a recent remix package, Gryffin's ‘Heading Home’ has been the catalyst for his apparent swift ascent this year, while also being the bridge for him possibly becoming a true original artist. 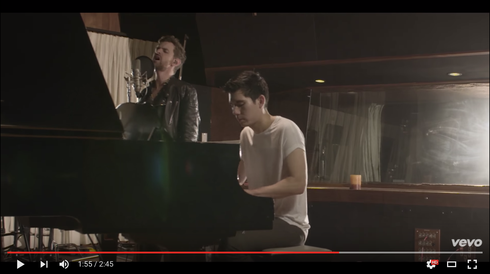 In the video, you will get a rare look at him and Josef Salvat doing an in-studio performance of a brand new acoustic version that breaks the song down into its elements. Recently, he played at Firefly Music Festival, following his apparent sold-out Heading Home Live tour, and official remixes for CHVRCHES, Troye Sivan and Jack Garratt that were released over the past couple of months.